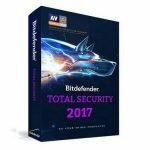 Bitdefender Total Security 2017 is the unrivalled anti-malware suite with minimal impact on PC performance. With a non-intrusive and extremely fast scanning technology, it offers the ultimate silent security against e-threats. Bitdefender Total Security contains a security solution that does not require any technical configuration from the user, and you will not be disturbed by popup-messages in Microsoft Windows. Everything can be configured automatically if you wish. Moreover, Bitdefender Total Security offers unrivalled protection against viruses, malware, spam and other malicious agents that can infect your computer. Bitdefender Total Security monitors all entry points to your computer – regardless if viruses attempt to sneak in via spam/phishing in emails, links on the internet, USB drives, social media such as Facebook, chat clients such as Skype etc., the threat will be neutralised by Bitdefender Total Security. You can also find more information on the minor editions of Bitdefender, such as Bitdefender Antivirus and Bitdefender Internet Security.